If you're looking for a durable, reliable replacement for a pneumatic wheelbarrow wheel, ALEKO's air filled replacement wheelbarrow wheels are exactly what you need! 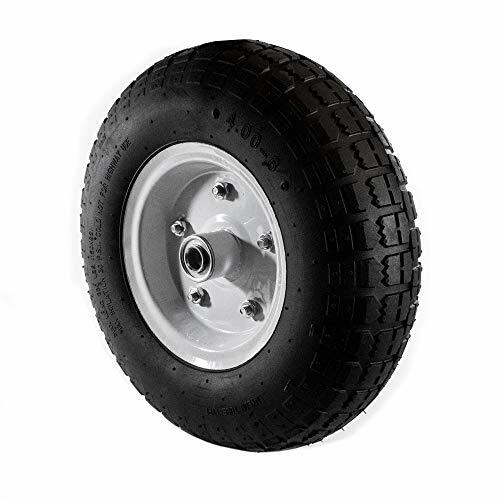 Our tires are perfect for your wheelbarrow or other small garden and lawn equipment, like garden carts, hand trucks, air compressors, pressure washers, or anything else you need to cart across rough terrain. The thick rubber tire works great for regular use of on rough terrain like rocks or brambles. They are resistant to UV rays, and won't be affected by rough weather. The centered hub is perfect for a single wheel wheelbarrow. 13 inches diameter; 4 pounds in weight; 3/4 inch bore size; 300 pound cargo weight limit. Color: Black tire with a white rim.